We’ve already gotten glimpses of Scarlett Johansson as The Major and Pilou Asbæk as Batou. If these leaked photos are to be believed, here is our first look at the other members of Public Security Section 9. 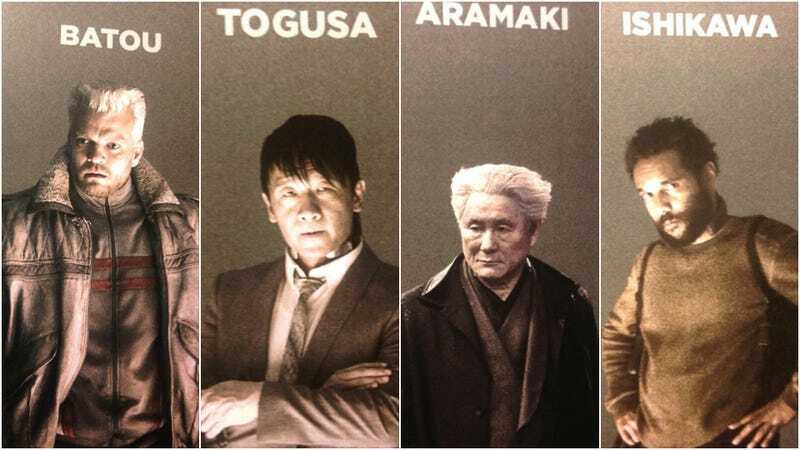 Of course, Section 9 is the intelligence department in the Ghost in the Shell universe and headed up by Chief Daisuke Aramaki. These unconfirmed photos have been floating around on sites in Asia, including major ones like Apple Daily. Beat Takeshi as Daisuke Aramaki. Here’s Chin Han as Togusa. There are also more images of The Major and Batou. The Ghost in the Shell live-action film will hit theaters next year.